Handheld gaming devices have much more competition these days than they did ten years ago when Nintendo's Game Boy Advance ruled the market. The prevalence of smart phones and the low barrier for entry for mobile developers, mean that most of us have a gaming device in our pocket all the time. Add in the ubiquity of WiFi/3G connections and chronic social integration, and odds are you've got tons of games right there at your fingertips. Waiting for Chinese take-out? Fire up Battleheart. Plane still hasn't taken off? Look, it's Words-with-Friends. So much of my gaming-on-the-go has migrated to smart phones that I don't even use my DS anymore except for exclusive titles. So what's a developer to do? Well, if you're Sony, you decide to eliminate as many of the handheld compromises as possible and try to recreate a full feature console experience on a smaller device. That means no shortcuts in terms of the controls, no reduction in graphics performance, and no arbitrary limits on the catalog of games you're willing to publish. Then you sit back and hope the trade-offs you've had to make in terms of size and battery life don't eliminate the whole point of a portable gaming system in the first place. I've been playing with the Vita practically non-stop since Sony sent us our review unit last week, and I think it's by far the most attractive and robust handheld system I've ever seen. The first thing I noticed about the PS Vita was how solid it was. It feels substantial and rugged, like you could beat a mugger to death with it and still count on it working while you're waiting for the police to show up. It looks a lot like the PSP, which is great in my book; whatever that older system's other failings, it certainly wasn't ugly. The glossy finish attracts fingerprints like crazy, but the sleek design is definitely eye-catching and the system manages to include loads of inputs and features without feeling cramped. Along with the 5-inch OLED screen, you get a d-pad, two analog sticks, four face buttons (plus three more system buttons), two shoulder buttons, multi-touch panels on the front and back of the device, rear and front facing cameras, and a six-axis motion sensor. There are also convenient ports for charging, a combined headphone/mic jack, and easily accessed volume and power controls. 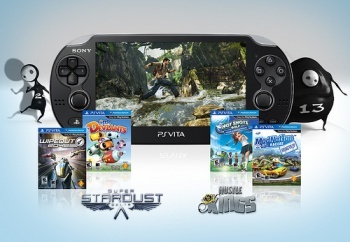 I've spent lots of time with most of the Vita's launch titles and, in general, I'm very impressed. Some, like Uncharted: Golden Abyss or Rayman Origins, go a long way towards proving that console-quality experiences can exist on the handheld. Others, like Ultimate Marvel vs. Capcom 3 or Michael Jackson: The Experience, seem to be struggling against the new format and are either ignoring the limitations or groping for a gimmick to make them work. Having the dual analog sticks makes all the difference. When games like SOCOM or Star Wars Battlefront came to the handheld market, they had to adjust to the lack of a second analog stick by making some core adjustments to the gameplay. Shooter fans had to deal with all sorts of compromises - auto-locks, fixed movement paths, and even entire changes in perspective. Sitting down to play Uncharted, I immediately felt at home. This feels like a game controller so zooming, aiming and shooting are as natural as they are on the PS3's six-axis or the 360 gamepad. But while the buttons are all there, the overall placement doesn't work as well for more frantic games like Marvel vs. Capcom. As precise as I tried to be, the smaller size of the device made it difficult to nail the precise stick moves and button presses required to pull off special attacks and combos. The multi-touch panels on the front and rear of the device are often used in ways that more than make up for the lack of extra shoulder buttons. Uncharted's touch screen inputs are generally helpful, but being able to just draw along the paths you want Nathan to climb makes this feel less like a game and more like an exercise in laziness. The track creation tools in Mod Nation Racers Roadtrip and the intuitive ball-shaping and rolling interface in Touch My Katamari seem much more natural and offer intuitive and natural ways of interacting with the device. Other games were less impressive. The lack of any inventive touch screen support for Hot Shots Golf seems like a missed opportunity, particularly in light of FIFA's controls where you can actually draw your passes directly on the game screen itself. The lack of some sort of tactile interface for the golf swing is dumb.